Lieut. 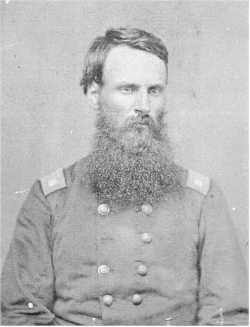 Col. John A. McLaughlin, Forty-seventh Indiana Infantry. Edwards Depot, Miss., May 18, 1863. About 9 o'clock on the morning of the 16th, I was ordered to form in line of battle on the left of the road leading from Clinton to Edwards Depot. After forming, it being on Champion's plantation and in rear of the houses, the line was ordered to be advanced beyond the houses about 100 yards, where the regiment was halted, and Companies G and B were thrown forward as skirmishers, covering the entire front of the line occupied by the regiment, when the whole moved forward slowly and cautiously for a distance of about 200 yards, when a brisk fire was opened on the left of our skirmishers. The enemy fell back, when the two companies as skirmishers were relieved by Company A, soon after which word was received that the enemy were attempting to flank us on the left. I immediately changed the line of battle, and threw the three left companies forward, but failing to meet the enemy after advancing a short distance, I was ordered to move to the support of the Eleventh and Forty-sixth Indiana Regiments, which were engaged upon our right on the road. I ordered in the companies that were out at the time, and immediately moved by the right flank in double-quick time, crossing the road under a galling fire from the enemy, and formed on the crest of the hill, within 50 yards of the enemy, who were sheltered behind a dwelling-house and out-buildings and heavy timber, which gave them decided advantage, and enabled them to pour a heavy fire upon us. Yet our position was maintained and the fire returned, lasting about one hour, when, by reason of overwhelming numbers, they were enabled to flank us upon the right and left, which rendered our position difficult to hold longer, in consequence of which we fell back about 200 yards to the crest of the hill, near a corn-field, and formed in line of battle at right angles with our former position, which was held about two hours, until re-enforcements were received, when the enemy were repulsed and driven back and the ground reoccupied, after which the regiment retired to the corn-field, in rear of the field of battle. The men exhausted, we rested and reorganized our shattered ranks, and the men filled their cartridge-boxes. After resting about one hour, we were ordered to move forward in support of the column that was driving the enemy. We marched about 2 miles, when we were ordered into camp for the night. Taking into consideration the length of time we were engaged, the overwhelming numbers to contend with, and the loss sustained, is satisfactory evidence of the gallantry and courage shown by the officers and men under my command. They did their whole duty. Sir, in regard to number and names of killed, wounded, and missing of the regiment under my command, you are referred to special report. I have the honor to be, sir, very respectfully, your obedient servant. Comdg. Second Brig., Twelfth Div., Thirteenth Army Corps.